Аналоги: 26. Даташиты: 21. Инструкции: 1. Новости: 10. Остальное: 14. Программы: 3. Профиль пользователя: 1. Торрент: 1. Форум: 10. 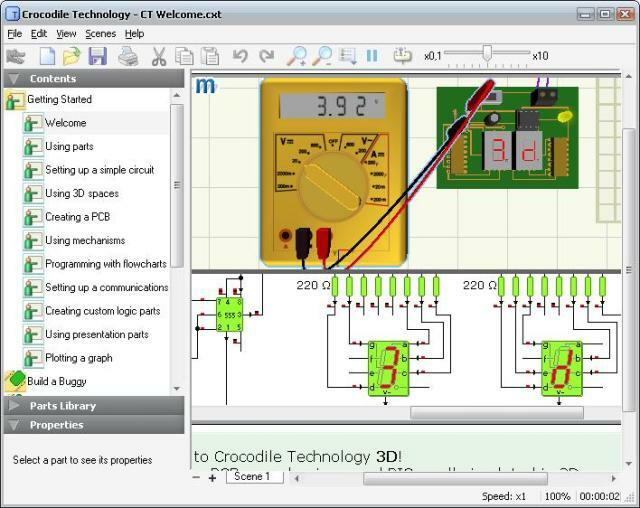 Crocodile Technology combines electronic design, PIC programming, 3D mechanisms and 3D PCB simulation. Design using updated electronic simulation - with over 100 new chips. Include powerful PICs, and write programs easily. Add inputs, outputs and mechanisms to a 3D circuit board; real-PCB autoroutes and autoplaces your circuitry. To make the product, export the PCB design and send your program to a real PIC. Finally, use the 3D simulation and a new digital multimeter for testing. Copyright. Техподдержка: support@rh.md. Кодинг: xoops.ws. PHP: 0.268 сек. MySQL: 63 запросов.